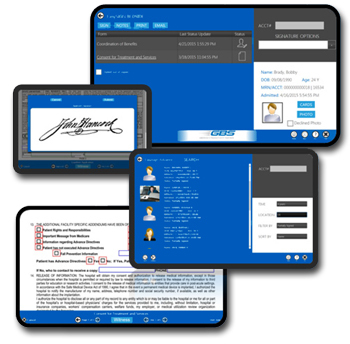 Using a tablet and the hospital’s registration system, EasySIGN’s interactive forms are presented to the patient for completion and signature and then seamlessly documented in the EHR or Archival System. You can easily upload patient photos, ID images (driver’s licenses and insurance cards), take payments, and have forms and consents signed even at the bedside. Plus, register patients even when your Admission Discharge Transfer (ADT) system or network is down. With EasySIGN, reduce paper costs, streamline document management, enhance patient satisfaction, and increase return on investment with quicker registrations. It’s so easy! One lost consent form may represent $580,000 per year in compliance costs for the average U.S. hospital.